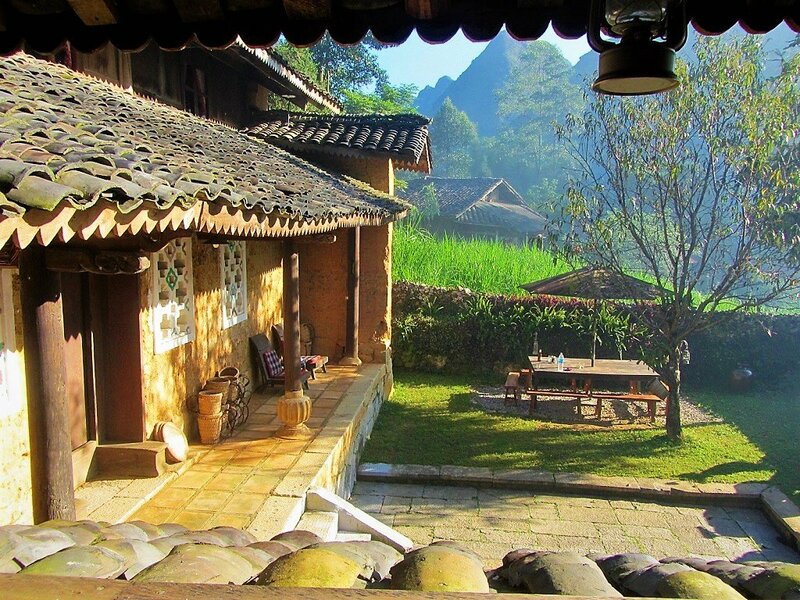 A timber, tile and clay structure encircling a stone courtyard surrounded by a stone wall with haunting limestone peaks looming all around, the Auberge de Meo Vac is a remarkably atmospheric place to stay in Vietnam’s northernmost province, Ha Giang. 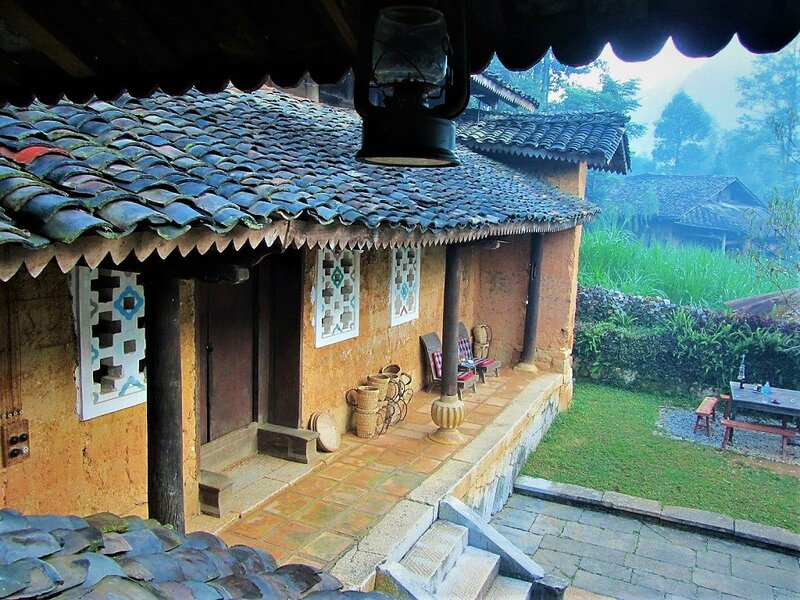 Originally built in the 1930s as a home for a wealthy Hmong family, the adobe structure was faithfully restored in 2011, and is now the most distinctive place to stay in the town of Meo Vac, at the end of the legendary Ha Giang Extreme Loop. 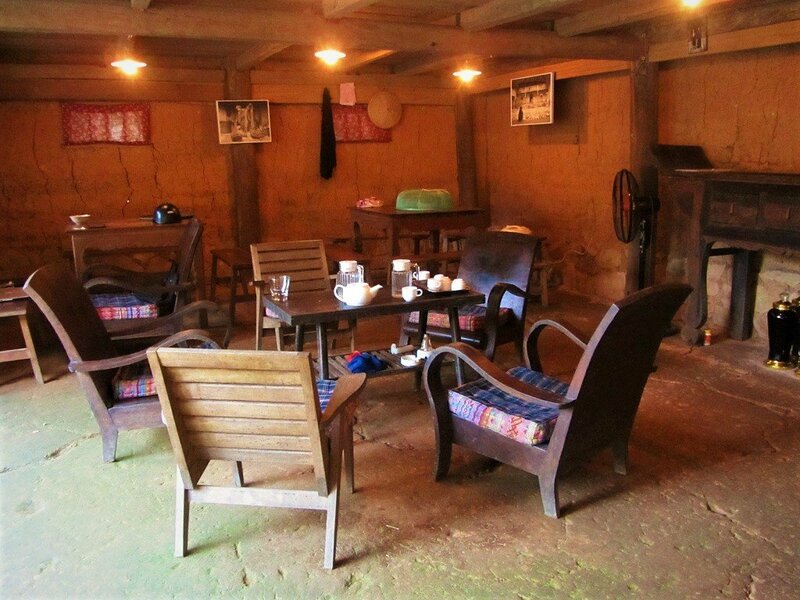 Located just out of town, on a slope among fields of elephant grass and sweet corn, the Auberge de Meo Vac (also known as Nhà Cổ Chúng Pủa) sits at the bottom of one of the steep limestone karsts that hold Meo Vac in a protective fist. I’ve stayed here a couple of times – once with a friend on a motorbike road trip, and once with my family on a 4×4 tour of the north – and loved it. There are dorms and private rooms, making it suitable for budget and mid-range travellers alike. Hidden away down an increasingly narrow paved road, which becomes a lane, which becomes a pathway, the Auberge de Meo Vac is a 5-minute stroll north of the sleepy town centre of Meo Vac. The Auberge is enclosed by a thick stone wall, around which locals grow sweet corn, herbs, and other vegetables. The wall runs around the perimeter of the Auberge, creating a kind of compound for the accommodation. But it doesn’t feel too private or closed-off, because the stone walls, although very thick, are only a few feet high, allowing guests to see out over the surrounding crops, houses, and limestone peaks. 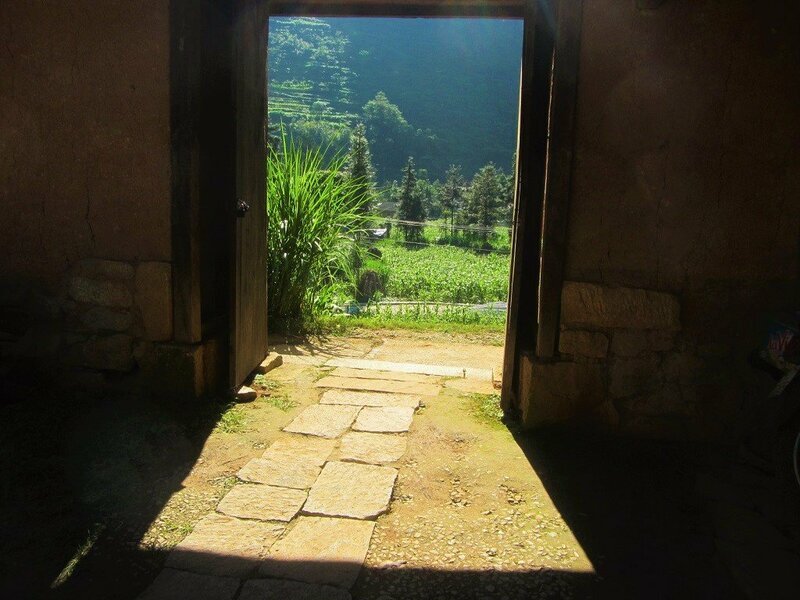 The first time you visit the Auberge, excitement builds as you approach the entrance gate via the narrow pathway. An imposing double wooden door leads through thick mud-brick walls, flanked by faded carved stone reliefs of dragons. Rough paving slabs lead under the arch and into the main stone courtyard, where the two-storey, yellow ochre facade of the Auberge bears down on the communal patio. The complex of buildings that makes up the Auberge de Meo Vac is fairly simple and small, but striking, stark, and very attractive. The main structure fronting the stone patio is a two-storey rammed-earth building raised on a stone base with wooden beams supporting its overhanging tiled roofs. White windows with decorative ventilation slots adorn the otherwise bare adobe walls. Accessed via stone steps to a thick wooden door, the main structure opens onto a shared living room, with lamps, wooden furniture, and a large fireplace. Up the steep and fairly treacherous wooden stairs, the second floor is cramped but cosy: it feels like the loft of a medieval home. 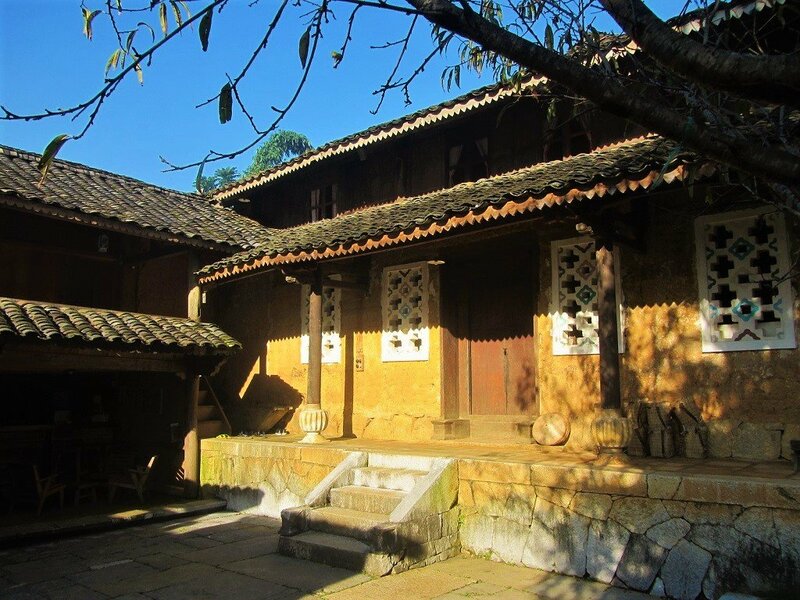 One side of the main courtyard is open to the countryside, but the other features a wood-and-tile structure on stilts, with the bar and reception downstairs, and the communal dormitory upstairs. 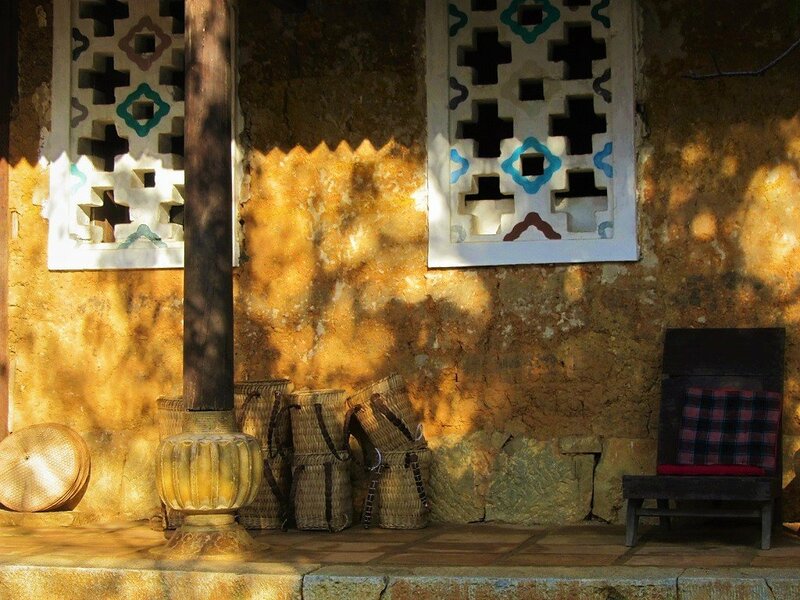 The stone courtyard is the main focus of the Auberge: it’s a special and enchanting place to be. The Auberge de Meo Vac is absurdly photogenic and picturesque, especially in the early mornings and late afternoons, when the low sunlight illuminates the clay walls, casting a warm light and long shadows across the stone courtyard. The Auberge has a remote, other-worldly, and timeless quality. To me, it can feel quite disorientating at times: I’ve stayed in similar places in southwestern China, on the Mongolian steppe and the great plains of Central Asia, and even the deserts and oases of the Arabian peninsular. 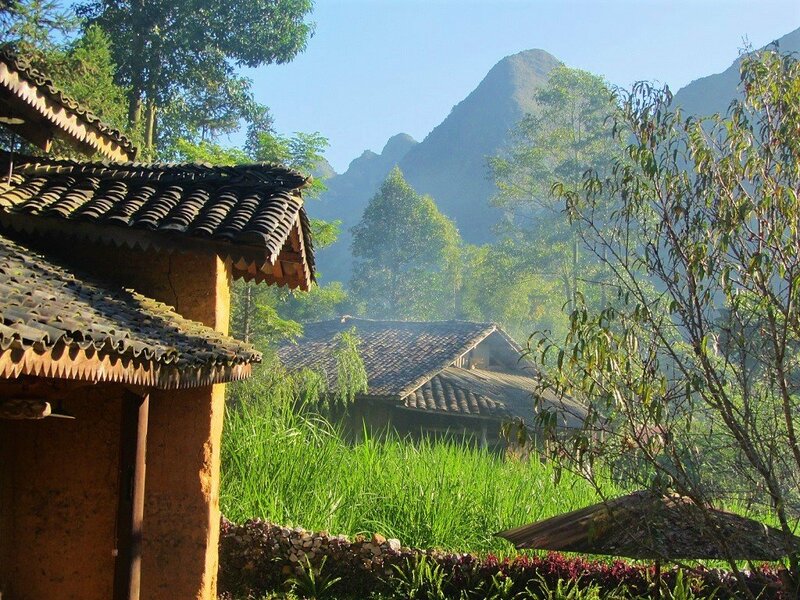 And that is part of the magic of Ha Giang Province: it’s stark, bold, beautiful, haunting, empty, and enthralling. The Auberge captures much of this in its style, location, and accommodation. 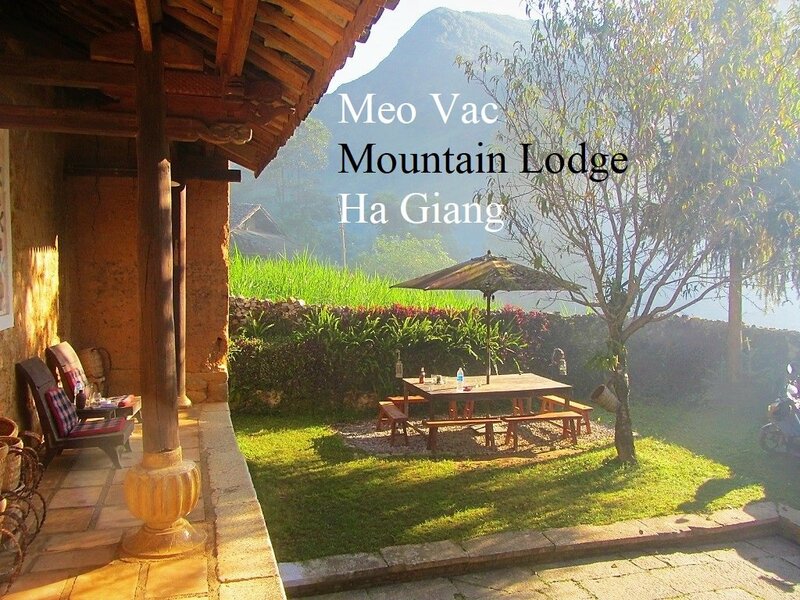 It’s a fitting place to stay when visiting Meo Vac as part of the Ha Giang Extreme North Loop, especially after days of long, hard riding in the mountains. The sleeping capacity of the Auberge de Meo Vac is very small. There are only four private, double-occupancy rooms (two on each floor of the main building), and a communal dorm on the first floor of the outbuilding, which sleeps a maximum of 8-10 guests at a time. The dorm accommodation consists of single mattresses laid on a wicker mat on the wooden floor in a cosy room with soft lamp light, wooden beams, bare stucco walls, a wood-burning heater (necessary in the cold winter months), windows looking over the courtyard, and a balcony with lovely views onto the Auberge rooftops and surrounding countryside. At upwards of 330,000vnd ($14) per person, it’s expensive by dorm standards, but still in the budget price bracket, and well worth it for the experience of staying in such a memorable place (even if you do have to put up with the snoring of your dormitory companions). 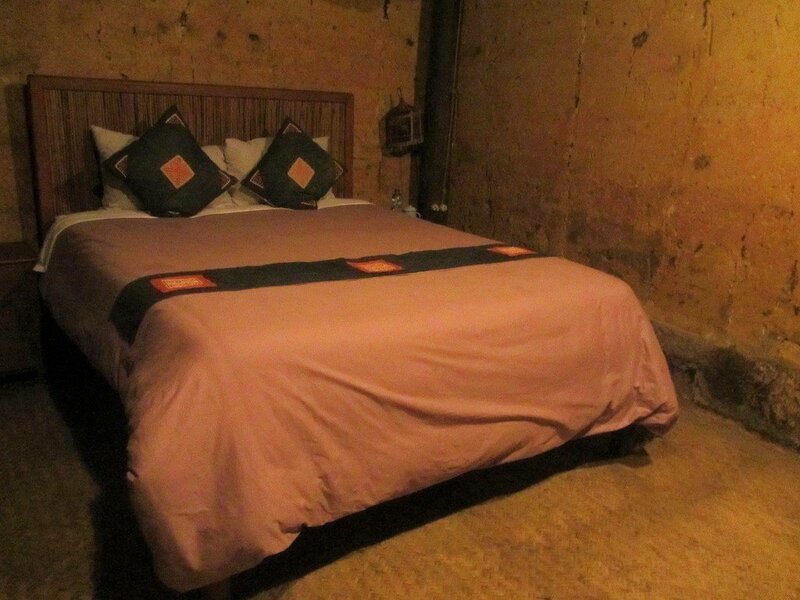 The private rooms are tasteful and atmospheric, but a bit dark and cramped for the price: 1,320,000vnd ($55). 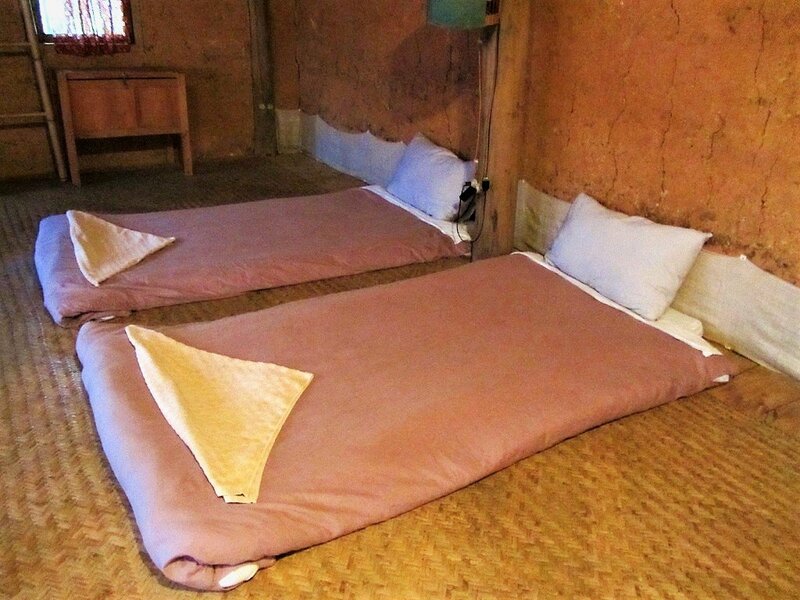 Large, comfortable beds sit on woven rattan carpets with lanterns illuminating the bare adobe and stone walls and structural wooden beams. Unfortunately, privacy is a problem, due to very thin walls and large gaps in the partitions. It’s also important to note that all rooms – private and dorms – have shared bathrooms, which are located on the ground floor behind the main building. 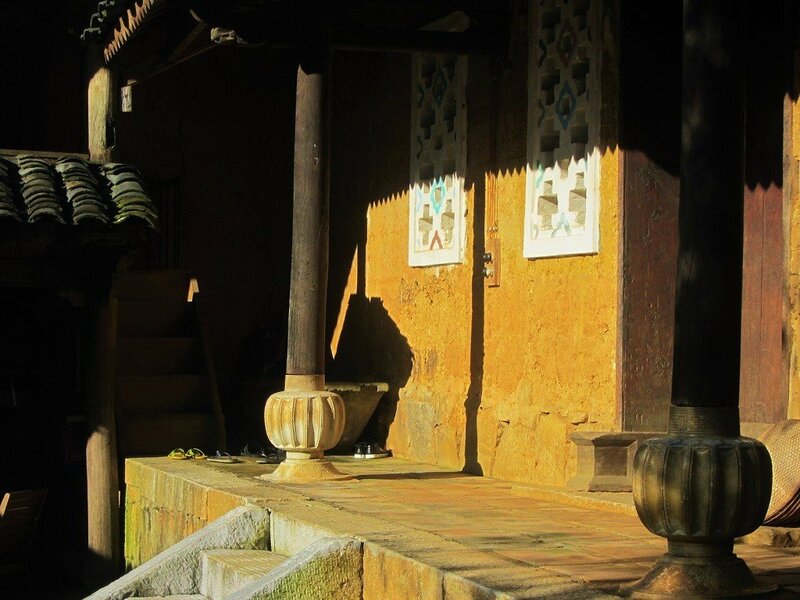 Like everything else at the Auberge, the bathrooms are very tasteful, featuring stone and stucco walls, tiled floors, and beautiful stone sinks outside in the garden under bamboo bushes. Be very careful when negotiating the walk to the toilet during the night: it’s a death trap of wooden struts and steps. Room prices do not include breakfast, but all meals can be taken at the Auberge if you order in advance. Breakfast, lunch, and dinner (including vegetarian options) are available for between 100,000-250,000vnd ($4-$10). All meals are set menus according to whatever ingredients are in season and available at the local market in Meo Vac. The food is fresh, local, beautifully presented, and delicious, with the possible exception of the continental breakfast, which is fairly average. 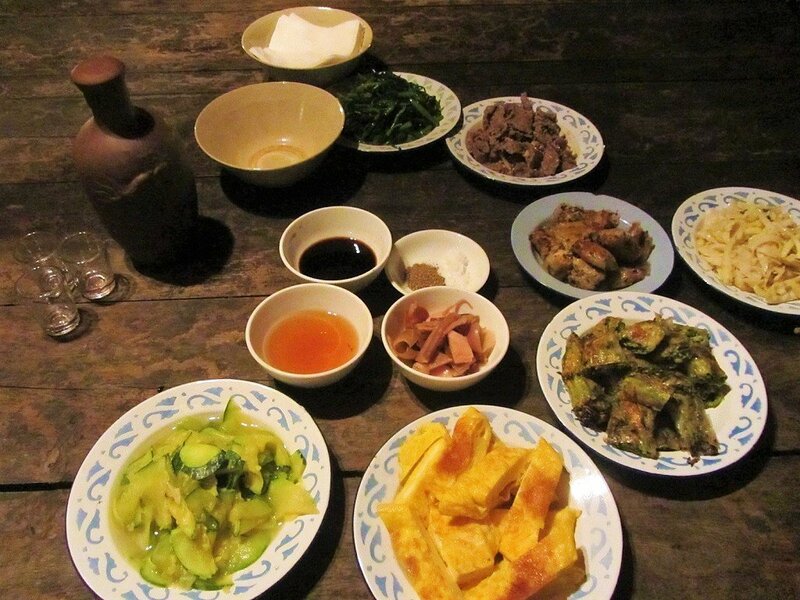 As an example, my first meal at the Auberge was stir-fried morning glory, local gourd, bamboo shoots, spring rolls, pickled ginger, stewed pork, and egg rolls. Meals are served on the premises: you can choose to dine on the wooden picnic bench outside in the stone courtyard (perfect for summer nights under the moon and stars), or on the wooden furniture in the open-sided bar area, or in the communal living area on the ground floor next to the open fire (very cosy on cold, wintry nights). Drinks are available throughout the day, including juices, soft drinks, tea, coffee, cocktails, such as gin and tonic, home-brewed plum wine, and local corn liquor. In general, I found the alcoholic drinks to be good, and the coffee bad. 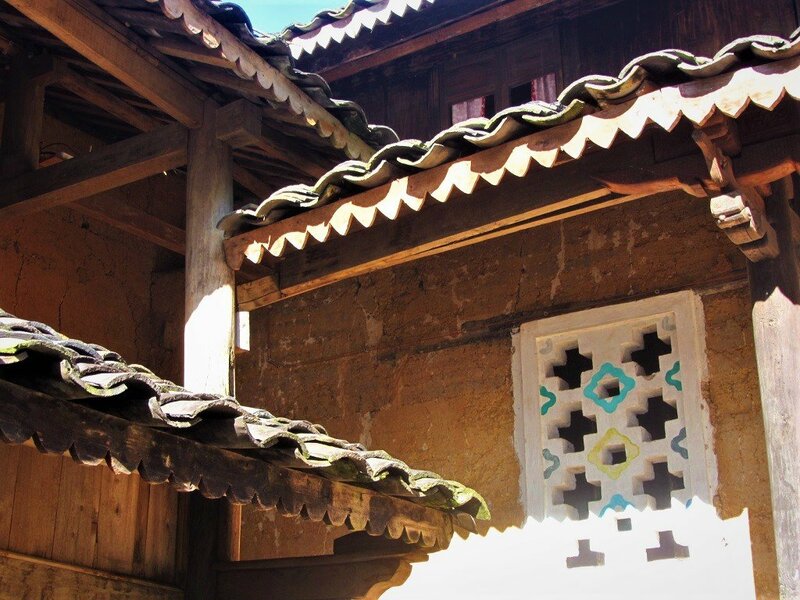 The Auberge can also arrange lots of activities, such as hiking and trips to local ethnic minority markets. 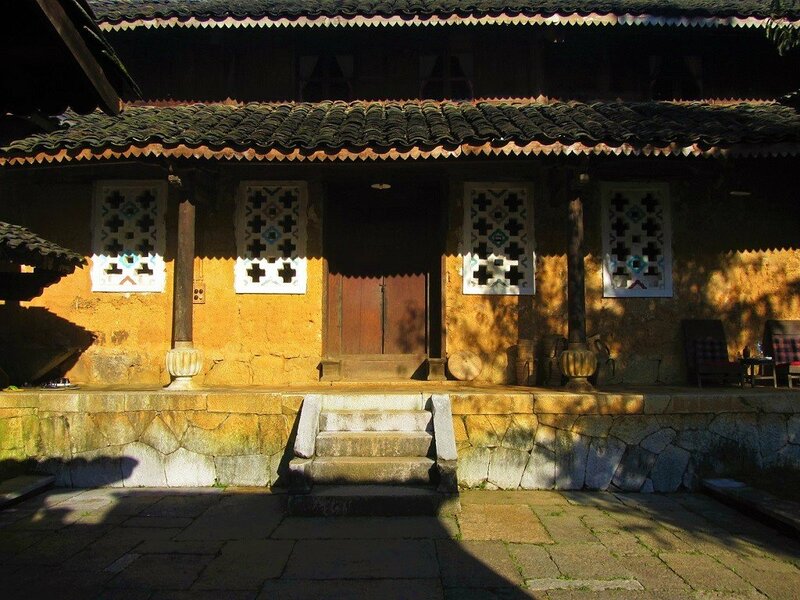 At night, as in all homestay-style accommodation in Vietnam, there’s the procession of sounds from outside: the night-time chorus. 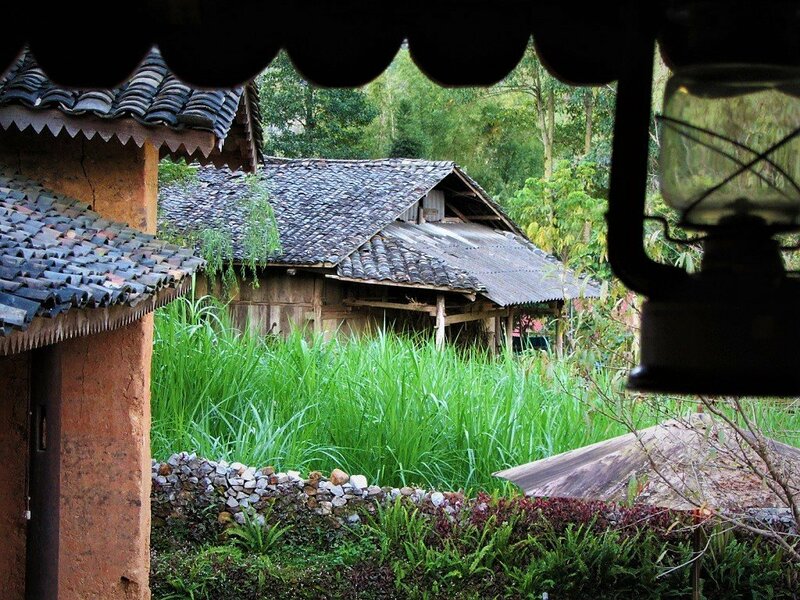 By day, even rural Vietnam is largely dominated by human sounds: motorbike engines, voices, farm machinery. But by night, animals rule the airwaves. From early evening the cicadas and the frogs and other bugs hum in the background; then the dogs in the dead of night, and cowbells from restless cattle in their straw cowsheds; then the cockerels, crowing from 4am in an increasing cacophony, until the sun rises. And, if the weather is bad, the sound of the rain hitting the tiled rooftops. But one thing to remember when you’re staying at the Auberge de Meo Vac is that this is not a homestay; it’s a business. And, although staff are nice, they are not ‘hosts’ like the families of a homestay. Don’t expect a personal touch: this is a hotel, a unique and special one, certainly, but nonetheless a hotel and a business: you aren’t entering someone’s family home, and witnessing their daily life. This can feel quite jarring, because the Auberge feels like a homestay: but it isn’t.